Concrete Paver Cleaner - Tile Tech Inc. It is very important to keep pavers free from oxides, mortar, leaves, bark, scuff marks, rubber tire marks and cement. The reason for this is that such markings can potentially permanently stain paved surfaces. It is recommended that whilst paving is in process, that you spot clean the pavers, using non-acidic products, so that stains are removed straight away. There are pressure cleaners available; however, if the pressure is too high, it may cause damage to the pavers. Therefore, testing of pressure cleaners before use is highly recommended. There are so many types of paver materials, so you need to use the right product and method, for the material type of your pavers. Whatever the type of pavers you have, we all like to look at beautiful, clean, colorful pavers. So by cleaning your pavers on a regular basis you are pro-longing that ‘new’ look. Paver cleaners are so effective, that it is possible to clean oil off your driveways and garage floors. 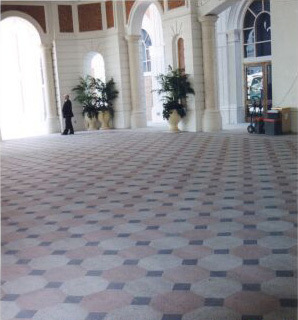 With the use of heavy duty cleaning products, you can say goodbye to your stained pavers. It is however recommended that such grease and oil stains be attended to as soon as possible, for the longer they are left, the deeper the stains will penetrate into your pavers. Efflorescence is the white chalky residue that can build up on your paver’s surface over time. It is caused by the natural salts that occur in the materials used to produce pavers. With the use of various concentrated cleaners, such efflorescence can be removed from your pavers. This will rejuvenate the color and appearance of your paved surface. Rust stains on your paved surfaces can also be cleaned with the use of hydrochloric acid solutions. However, if you have clay pavers, be careful not to use acid solutions, simply consult your pavers’ suppliers before cleaning. Moss and algae can sometimes grow on your paved areas, particularly if they are in shaded areas or covered by trees all of the time. There are specific moss and algae removing solutions available on the market. They tend to take a few days to take effect, and are best applied on a dry day, for good results. Cleaning Pavers Before You Seal! It is important to note that you must clean your paved surfaces before you apply a sealer. This is recommended because sealing an already clean surface, means much better end results. When pavers are first laid, if they are cleaned and then sealed straight away, you will also find that that using a paver cleaner will be much easier and more effective.